I eat kimchi really regularly and I found a lot of the store ones lacking in texture or flavour. Quite often they were quite sour or mushy. I started making kimchi after my sister started experimenting (she once almost set my mouth on fire with one of the versions she made). In my recipe I needed the ingredients to be fairly accessible at any Asian grocery store – the only thing I wouldn’t compromise on is the Korean chilli flakes, they give you the flavour that you expect from kimchi. The glutinous rice paste is an important component because it’s actually what causes the fermentation – I find it weird to read recipes that don’t feature it. Depending on the type of salt you use, you may need to vary the seasoning – if you make a batch and it seems too salty, then just modify it for the next batch and you’ll eventually personalise this recipe to your taste. I eat kimchi on it’s own or you can make kimchi soup, dumplings or fried rice. 5g roasted belachan, to roast the belachan, wrap in a piece of foil and roast in an 180 degrees oven till fragrant (approximately 5 minutes). To prepare the wombok, slice in half and then in half again so you have 4 wedges of wombok. Place the water in a large plastic tub and dissolve three quarter cups of salt in the water. Rub the last quarter cup of salt in between the leaves of the wombok. Submerge the wombok into the water and cover the tub with a lid. You’re basically salting the wombok till it softens enough that the leaves will become “bendy” and not snap. Depending on the temperature in the room it can take anywhere from 3-6 hours (shorter on hot days, longer on cold days). You should rotate the wombok 1-2 times during the soaking period so that every wedge gets submerged in the brine. When the wombok is ready, drain it and wash it three times before straining for 1 hour in a colander. To prepare the kimchi paste, place the water, dried shrimp, kombu and dried mushroom in a small saucepan. Bring to a gentle boil and simmer for 5 minutes. Remove the saucepan off the heat and remove the solids. Return the liquid back onto the heat and add the rice flour. Immediately whisk the rice flour into the broth and bring it to a gentle simmer for 2 minutes. Remove off the heat and set aside to cool. In a small food processor, add the cooled rice flour paste, ginger, garlic, salt, chilli, apple, fish sauce and roasted belachan and blend together. Pour this into a bowl and mix in the gochugaru, spring onion and carrot. Mix everything together. This is the bit that gets messy so I’m going to STRONGLY suggest you wear gloves. Have a clean food safe plastic bag ready to place the kimchi in. You could just place it straight into an airtight container but it’ll make everything quite smelly. Put on the gloves, squeeze out any extra water from the wombok wedges. Take one wedge of wombok and start rubbing the kimchi paste in between every layer of leaves. Make sure the whole wedge is covered in the kimchi paste. Roll it up and place it in the plastic bag. Repeat with all the wedges of wombok. The carrot and spring onion can be tucked in between the leaves as well. 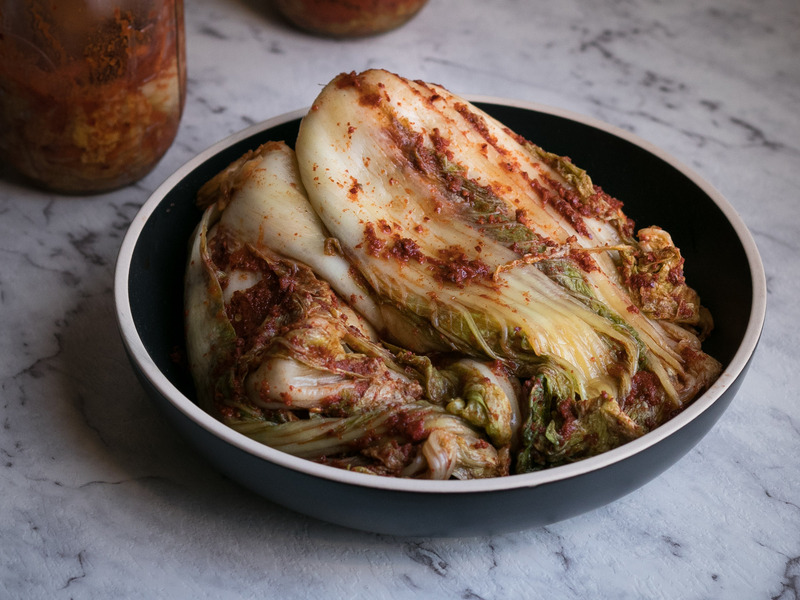 You shouldn’t have leftover kimchi paste but if you do, just rub it all over the wombok. Squeeze out the air from the bag and twist it up to enclose the wombok wedges. Place the bag in an air tight container and leave it to sit in room temperature, out of direct sunlight, for 24-36 hours. If it’s really warm in your house the fermentation will happen much faster. When you’re ready to pack the kimchi away, remove the wombok wedges from the bag (wearing a glove!) and slice them into 4-5cm chunks. Trim off the stem at the end of each wombok wedge and throw it away. Pack the chunks of kimchi into sterilised jars, push down with a chopstick or wooden spoon to remove air from between the kimchi. Fill to the brim of the jars and screw the lids on tightly. Place in the fridge and allow to ferment further for another week or two.